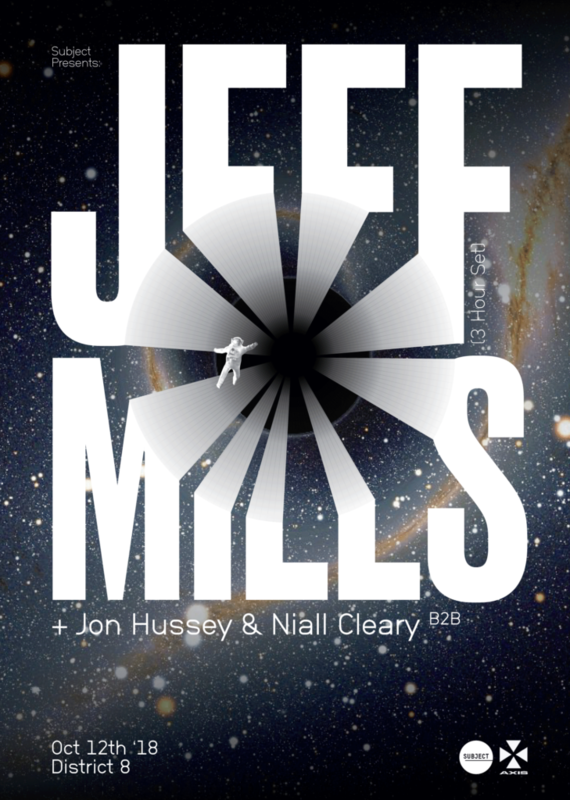 Well this is brilliant news for a Thursday… District 8 have just announced what we’ve all be hoping for, Jeff Mills is returning to Dublin for a very overdue club show this October. Jeff Mills – 3 Hour Set. Making his first Dublin club appearance in almost 2 years, the legendary Techno figure will return to District 8 on Friday October 12th… Opening proceedings are long-time Irish Techno stalwart Jon Hussey who plays a special back 2 back set w/ Subject’s Niall Cleary. Mills joins an already bustling Autumn/Winter season at Subject w/ Perc, Chris Liebing, Robert Hood, Octave One, Freddy K, Mode_1, Cailin, FracTAL announced, including an Electric Picnic/Anachronica takeover w/ DeFeKT, Eomac, Eavan & Niall Cleary. Join the event page here and pick up tickets here. Want to listen to something to get you in the mood? This in our opinion is the greatest Jeff Mills mix of all time. Stick it on and let us know if you agree.